Growing up in church many times I heard the story of Abraham as told in Genesis. This man who is referred to as “the friend of God” is also held up as a great example of faith. Regarded by the Jewish people as their forefather through his son Isaac, he is also revered by the Arab nations who count him as their forefather through his son Ishmael. As for me, this is my covenant with you: You will be the father of many nations. No longer will you be called Abram; your name will be Abraham, for I have made you a father of many nations. I will make you very fruitful; I will make nations of you, and kings will come from you. As a child I did not think too much of Abram making this name change. I know he is pointed out as a man of faith because he obeyed God and left his home and country to go to a new place that God would show him. Also his willingness to obey God and sacrifice his son, Isaac, trusting God to restore him to life is another example used by those who point him as our example of faith. But as I read this week of this change of name I think this might have been the greatest example of his faith. You are a rich man with lots of cattle and servants. Many people look to you as their employer, their master, the one who supplies their daily needs. You are now 99 years and your wife is also very old – clearly past the time to bear children. I can almost imagine the comments made by the servants that night in their tents. Father of a multitude? Right! He has not been able to have any children with his wife all these years – and now at 99 he’s going to have a multitude of children! What does he plan to do – take a dozen wives? Yeah – even if he takes a dozen wives – a man his age – is he really capable of fathering a multitude? Maybe he is losing his mind – old people do get crazy sometimes. Yet Abraham believed God and made that change. And how did that turn out? Today there are about 14.5 million Jews in the world. Statistics I could find show there are between 407 – 402 Arabs in the world. There are 22 Arabs states in the world and Israel – what an amazing story there – is once again a nation after being destroyed by Rome in AD 70. Abraham is also revered as the forefather of the Arab nations and Islam, as he was also the father of Ishmael, his son through Hagar, Sara’s Egyptian princess handmaiden. The Koran reports that Abraham and Ishmael raised the foundations of the Kaaba, the cube-shaped black stone structure in Mecca, Saudi Arabia, which is Islam’s holiest shrine. During the annual Haj pilgrimage, Moslems from all over the world circle the Kaaba, reinforcing the central role of Abraham and Ishmael in Islamic faith. On Rosh Hashanah, the Jews recalled the story of Isaac’s near-sacrifice, which Jewish tradition states occurred on the first of Tishri and honor Abraham’s faith and obedience to God. Father Abraham had many sons, many sons had Father Abrham. And I am one of them and so are you, so let’s just praise the Lord. Thinking of the faith Abraham had to declare he was to be called, at age 99, “Father of a miultitude” makes me wonder how many times God speaks to us about something in our lives and we are afraid to share it. Afraid others will think we are crazy, or maybe even being prideful. I remember when God called my husband and I to sell our home and possessions and go to the Philippines to teach. I thought my co-workers might think I was crazy but I was amazed at the response of my fellow Christians. Some thought we were fools to sell everything and step out by faith. Others thought we were boasting when we said God had called us to this. Then, there were those who wondered how we could do that to our family. Leave them alone and journey to the other side of the world. Has God ever called you to a task that you were afraid to share? Has God ever asked you to do something that others would consider foolish? Always trust God and like Abraham declare that which seems foolish and impossible. I recently watched a pastor of a mega church on television (which I don’t do on a regular basis) and was amazed at his message. He started off speaking of all the parts of our culture that Christians do not agree with. But then he lost me! Now I am not sure what he meant about “running them out of here.” Maybe he just meant we need to stand up for our beliefs and not let them scare us from speaking out. If so, I say Amen! But the body language and the attitude he displayed when making that statement I found so offensive and so not like Jesus Christ. Later that week I went to a conference where I heard a different viewpoint on our response to those who take a stand against our Christians beliefs. It was a Voice of the Martyrs conference where I heard stories of Christians being persecuted around the world. I saw pictures of young men badly beaten for refusing to deny Christ. I saw pictures of churches destroyed by bombs or fire. Then I listened to their response to how they treated their enemies. Over and over those who had been persecuted asked that we not only pray for them, but pray for those who persecuted them. Maybe if we prayed more for those who take a stand against Christian principles their hearts would be changed. Will you join me in praying for those who you disagree with? I was just six years old. Too young many would say to know what I was really doing. But I knew. I wasn’t totally sure what all being a sinner included, but I knew I was not one. Until one evening at church, I recognized I was. We put sins into a “big” and a “small” category. But sin is sin regardless of how big or how small it seems. He then mentioned what we call “small” sin – like lying or disobeying our parents. Now he had my attention. Just that week I had disobeyed my mother – and then lied to keep from getting in trouble. Now many may laugh at this or even say how terrible to make a six-year-old feel she was a sinner. But for me, it was one of the most important times in my life. Because I knew that Jesus loved sinners – and that He loved me. I also knew what I needed to do. So – I went back to coloring and waited until the end of the sermon. When the message was over, I put my colors and my coloring book aside and walked to the front of the church where I asked Jesus not only to forgive me, but I also committed my life to His service. Yes, I was only six, but yes I knew what I was doing. Shortly after that I was baptized as an outward sign of what had taken place in my life. Our church did not have a baptismal so we went to a farm pond where I, with several others, was baptized. Since I am scared of water and do not even like having water in my face in the shower, it was a BIG step of faith to walk out into that pond. But what a wonderful experience it was. 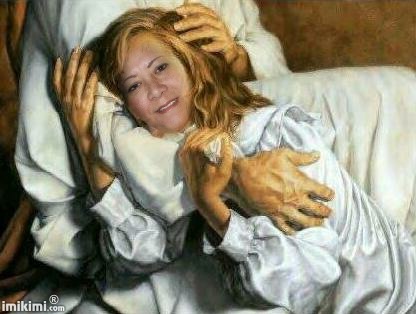 Just turning 70 this year, I have been following Jesus for 64 years. It has been a great walk with a great friend. While working on our church newsletter I found this cartoon and just had to share it. 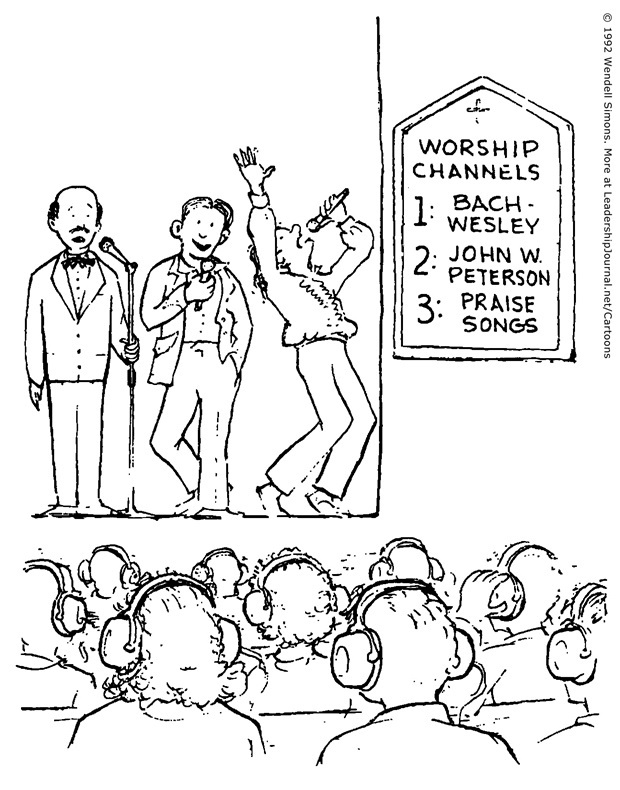 Hope it brings a laugh – and maybe a more serious thought about how you approach worship. We talk a lot about worship. We write/read books on the subject. We talk about the “style” of worship we like. There is contemporary worship, traditional worship, liturgical worship. In some churches the argument over what songs we sing, what instruments we use and whether or not we have a praise team or a choir has actually split churches. At many larger churches we see signs that advertise a certain style of worship will be used at one service and another style at a second service. Seems to me that we treat worship like we do other music. Some love country songs, some classical music and other rock and roll. So we appear to insist there are two kinds of worshipers. There is the “old crowd” who love their hymns and want something “traditional.” There is the “younger crowd” who want contemporary songs only with drums, keyboards and guitars or, if they do an old hymn need to change it to a more contemporary style. But is that really what worship is? Should my own musical likes or dislikes determine how I worship? Matthew’s Gospel tells us after the Last Supper before Jesus went to the garden to pray He and His disciples sang a hymn. If you want traditional music, how far back do we go for that? Just to the hymns of the 1800’s and England? Maybe we should go back to the Middle Ages and the Georgian chants? Most Biblical scholars believe the early church probably sang the Psalms? So if we want to have traditional music perhaps we should only sing the Psalms. Contemporary means: what is happening right now, marked by characteristics of the present period. So contemporary worship will be worship that is suitable and meaningful for the current population. It is not for those who lived hundreds of years ago. Therefore, we have to recognize that the “method” of worship will always be changing. From Psalms to Gregorian chants to Charles Wesley’s hymns to Chris Tomlin’s praise songs. For those “old folks” who long for the old hymns, just hang around a little longer. I found interesting studies as I did some research on the history of worship that many millennials are leaving churches with contemporary worship and returning to the liturgical churches with their organs and old hymns. Is Worship Just About the Style of Music? 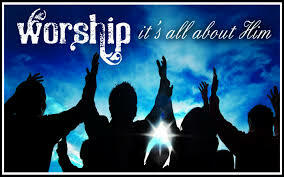 So our emphasis is not about the style of music, rather we have a praise team or a choir or a single worship leader. It is not about the “outward form” of worship. It is about the “inward form” – our heart. God is seeking worshipers who will worship him truly from their hearts. God could care less if we have the latest sound system and the best worship teams if we do not come to worship Him from our hearts. God wants our hearts! It’s 8:30 at night – I’m sitting in my recliner – in my pajamas – and I’m crying! The tears are partly a result of the tension of the past few days. For over a month I have been planning a women’s retreat for my church. With the guest speaker, who is my youngest daughter, I have brainstormed picking a theme, planning the lessons, the decorations, the music. I so wanted it to be a success. But as the weeks went by I had to ask myself – why do I want it to be a success and what needs to happen for me to consider it a success? Will it be a success if we have a large number show up? Will it be a success if everyone has a good time? Will it be a success if someone really is encouraged, really does develop a greater desire to know God, have a better appreciation for God’s Word? So I have prayed that my motives would truly be pleasing in God’s sight and that there would be nothing in my efforts that would desire anything other than that God would be glorified and lifted up. I have prayed that there will be a good response, that the women will show up, will enjoy, but most of all will draw closer to God as a result of the weekend. Then, there was the worry of getting it all to come together. Finding the right decorations to set the scene (but at a cheap price as I promised the church board it would not cost the church anything so the expenses are on me). Getting volunteers to bring food for our Friday night snack and breakfast and lunch on Saturday. Will I have enough food? Finding volunteers for the skit I want to do on Friday and for worship on Saturday. Praying for my daughter as she prepares the lessons I have asked her to do. In the middle of all this I start having terrible pain in one of my teeth. I had it filled last year but the dentist told me the tooth was really bad and he was not sure the filling would hold. A call to the dentist and off I got to get it pulled. I have my tooth pulled on Wednesday. Dentist tells me I can expect pain, bruising and swelling. But here it is Friday. I have had no pain, there is no sign of swelling or bruising. My husband says it’s a God thing. I truly believe my heart and my motives are right – that my desire is only for God’s glory. I find most of the decorations at the Dollar Store – budget saved. Tables are decorated and the room looks great. My daughter sends me her notes for the handouts and they look perfect. Volunteers have all responded and the skit, the worship, the food – it is all on track to be a great event. Friday morning I start cutting up veggies for the Saturday lunch. Suddenly my carefully laid plans all seem to come apart. My husband comes up from the family room in the basement and he looks white as a sheet. He tells me he almost passed out and off we go to the doctor’s office. After examining him and talking to his heart doctor, we are off to the emergency room for further evaluation. He had a heart attack in 2009 and has had 4 stents put in since then so the fear of another heart issue makes me very nervous. Now I’m getting up tight. Clearly I need to be here with my husband, but what about all the things I still need to do to be ready for tonight? Is he going to be okay? Is he having a heart attack? While waiting for the doctor to evaluate the EKG and the blood work I pick up my cell phone to start calling our kids to let them know their dad is in the ER. Before I can dial out, my phone rings and it’s our son. When I answer he tells me that he has just had a call from his wife and he is rushing to the ER in their town. Their daughter has been in a bad car wreck. He doesn’t know more than that but wants me and his Dad to be in prayer. I try to hold back the tears as I think – “What do I do?” I have to tell my husband, but is that going to add to his stress and cause a heart attack? After sharing the news with him, we hold hands, crying and calling out to God for our granddaughter. I watch the clock waiting for the doctor’s evaluation pulled between needing to be with my husband and needing to get back home and finish final preparations for the night session at the retreat. Of course, my husband keeps telling me I need to go on and get ready for the evening and I keep telling him no way I’m leaving him until we find out what is going on with his heart. And we keep waiting for our son to call with more information on our granddaughter. How badly is she hurt? Is she going to be okay? The doctor finally comes in and tells us that he is not having a heart attack but they do want to keep him overnight for observation and possibly do some tests in the morning. When I am assured that he is in no immediate danger, I finally leave, hurrying now to get cleaned up myself and get to the church to finish final preparations. We finally hear from our son. Our granddaughter was hit in the passenger side by a young man drunk and high on drugs. He hit her at such a high rate of speed it flipped her car over twice, crushed in the front and they had to pull her out through the windshield. But, miraculously she has no broken bones, no life-threatening injuries, but is terribly bruised and some cuts on her arms from being pulled through the broken windshield. While working with my daughter to put the finishing touches on everything at the church, we get a text from my son. He has sent us pictures of my granddaughter’s car. When we see the pictures my daughter and I both began to cry and to spontaneously praise God. From the pictures of the car we realize we have seen a miracle. There is no way anyone should have walked out from the car alive. The whole front and right side is smashed in, the windshield completely broken out. We get pictures of my granddaughter’s neck and front of her chest. She looks like someone who has been severely beaten. Clearly she has subsisted some terrible bruising and will be in pain for some time. But no broken bones, no concussion. As we praise God, I feel the tension drain from my body for a moment. Then my husband calls. They are going to do an angiogram tomorrow morning. Doctor thinks they may be more blockage. I start to get uptight again, but I’m reminded in my spirit that the same God who protected my granddaughter is the same God who will be with my husband in the morning. But now, of course, I cannot be at the retreat on Saturday. I know between my daughter who is speaking and the women who will be leading worship I don’t have to be there. But I’m disappointed. I have enjoyed watching the women in our Friday session and seeing their hearts being opened to God’s Word – just as I had prayed – and I really want to be there Saturday to share with them. But I know there is no question about where I belong. I love my husband – my best friend – and I not only need to be with him, I want to be with him. The procedure is done and they have to put in another stent (his fifth). The doctor shows me an area where there is a 50% blockage but says he will not touch it until it becomes blocked enough to be life threatening. Because of its location it will require open heart surgery. This makes me nervous. How will he know it has become life threatening until it is life threatening? On top of that they had trouble getting the bleeding to stop and have had to put a pressure cuff on his groin which is pushing down and is very painful. While normally a person has to lay on still on their back for two to three hours, he lies all day – over six hours – not being able to move from his back and having this pressure cuff pushing down on his groin. A rough day for both of us. Since he cannot sit up, I help him try to get some food down. Granddaughter is very sore – will be out of commission for a few days – but she is alive, she is going to be fine. My husband is out of immediate danger. He has to stay overnight in the hospital just to make sure he does not move too much and the bleeding stays stopped. But, all is well with him. I can bring him home tomorrow. The retreat appears to have been well received by everyone. So, I need to be rid of all this tension. What do I do? Guess I could pick up a glass of wine. I could put on a favorite movie. I could take a hot shower, a sleeping aid and go to bed. But I turn to the one I have always turned to. My Savior, my Lord, but also my friend. I put on a CD by Selah, lean back and think of all the times in my life – when my father walked out on the family, when my first husband was accidentally killed and my daughters came home and found him dead, when I was diagnosed with cancer and told I did not have a very good chance of making it – and so many other times when crisis came and how Jesus has always been there. Giving me wisdom, peace, comfort. And as I meditate on His goodness, His love to me, the tension drains from my body and my tears become more than just tears of release. They become tears of love and gratitude. I turn to Jesus. Who Do you turn to?